I am so grateful for the opportunity to come home to practice with my father and the amazing staff I have known for most of my life. It is my privilege to earn your respect and trust in treating you and your family with the same compassion and individualized care that you have come to expect at Barra Orthodontics. Dr. James Barra was born in Washington, DC during the last year of his father’s orthodontic residency and moved to Chambersburg when he was an infant. Having been raised in Chambersburg, he attended and loved his time at CASHS. He stayed in the area for college, receiving his Bachelor of Science at Gettysburg College before earning his Doctorate of Dental Medicine at the University of Pennsylvania. While at UPenn, he was asked to be a teaching assistant in the orthodontics lab, fixed and removable prosthodontics lab, operative dentistry lab and community oral health course. During his senior year, he spent time in the orthodontics department at the Mayo Clinic where he was accepted for a clerkship. Upon graduation from dental school, he received the award for excellence in prosthodontics and like his father, was inducted into the Omicron Kappa Upsilon fraternity for academic excellence. 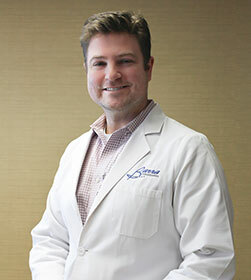 Immediately after graduation, Dr. Barra and his family moved to Southern California to complete is residency in orthodontics at Loma Linda University, where he earned his certificate in orthodontics and a Master of Science degree. He recently moved home to practice orthodontics exclusively with his father in Chambersburg where they plan to practice together for many years to come. Dr. Barra looks forward to contributing to the community that has helped to raise him. He has coached baseball with his brother at Guilford, a place that was his second home for his entire youth, and looks forward to coaching his boys for many years to come. He is also involved with his eldest son in Boy Scouts, as well as several local community organizations. Dr. Barra is married to Regina, whom he met and started dating in high school at CASHS. Together, they are raising three little boys within walking distance of the office and can’t wait to show them everything this area has to offer.